Do you know what you need to knock down a Cape buffalo? We do! There isn’t much agreement regarding the best calibers for taking Cape buffalo. 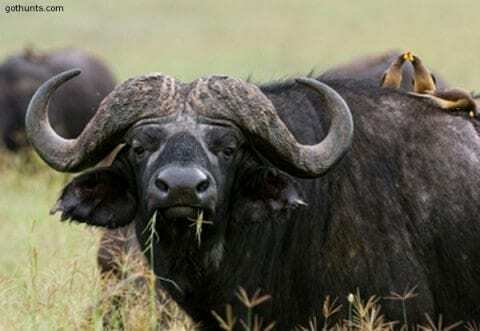 Cape buffalo are one of the toughest animals in the world to kill. We’ve all heard stories before. One of them took 7 500 grain solid bullets from a .458 over 45 minutes with over a mile of tracking and an additional shot by the P.H. before expiring. Another buff took 11 shots from a .375 and 2 more from a .470 N.E. and another took 9 shots from a .470 and a 500 before hitting the dirt. It took some big guns to bring the likes of Teddy Roosevelt, Ernest Hemingway and Peter Hathaway Capstick in the mouth of the fatal five and back out again safely (not to mention “the poor man’s buffalo” AKO Blue wildebeest). Roosevelt was a fan of an H&H 500/.450 double rifle given to him by a group of admiring Britons and a Winchester .405 1895 rifle. Capstick was known to use a .470 rifle. The .470 Capstick rifle cartridge was developed by Colonel Arthur B. Alphin in 1990 named after Peter Capstick. Some of the earlier rifles used included the .416 Rigby, 404 Jeffery and the .505 Gibbs. The .505 was a scary rifle with a 4 inch long cartridge that would fire a 525 grain bullet that is still classified today as a “ destructive device.” Today rifles include the Ruger Tropical .375 H&H, Browning Bar Safari rifle, .500 nitro, .460 Weatherby Magnum and even the .700 nitro and the .950 JOJ. Those last two are meant for elephants, not cape buffalo. .416 either in Rigby or Remington Magnum is the most popular caliber used. Any .400 bore or larger will be more than adequate for dangerous game hunting; .404 Jeffery, .470 Nitro, .458 WM or Lott and .416 Remington. You could justify using a double barrel rifle. Most people prefer a rifle that holds 4-5 rounds. A low powered scope or a telescoping sight with a 6 fold enlargement are both good options. Soft point Barnes X or TSX are great options for buffalo in a soft. Solids Trophy Bonded Sledgehammer is one of the most reliable options for any dangerous game. Woodleigh Solids, Barnes Banded solid are a couple options. You need both solid and soft point bullets. Carry no fewer than 15 rounds on your person, in a place where you can get to them quickly. Most if not all airlines have a 5 kilogram rule for ammo. Be sure to take what you need. For a longer safari.Take 60-80 rounds for the lighter rifle and 30-40 for the heavier rifle.